From the acoustic blend of banjo, dobro,lap steel, harmonica, upright bass, guitar and bass drum-tamborine to the honky tonk sound of piano, pedal steel, Telecaster, tenor sax, drum kit, electric bass and hard country vocals. Authentic, honest, true! Mix together classic hard country, old school rhythm and blues and roots rock and roll with 50 years of pickin' and these are the songs, add 50 years of pedal steel, banjo, dobro, Telecaster, lap steel playing and 50 years of bass playing, upright, doghouse, and electric, and this is the band. 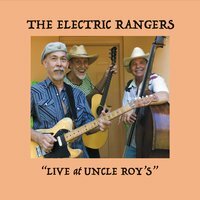 The Electric Rangers, started in the honkytonks of Honolulu in 1980's, Uncle Roy and Andrew D. are the last two standing, add professor Randy McDaniel to the mix and lo and behold "it's alive" Regrouped and ready, now calling Auburn, Alabama "home". Authentic, original, fun!